Win a Copy of Digital Textile Design! Interested in learning the art of digital design for fabrics? Enter this week's giveaway for a chance to win the newest edition of Digital Textile Design, written by Melanie Bowles and Ceri Isaac. Digital Textile Design covers everything novice textile designers need to learn about designing and printing digitally. Written specifically for textile designers, this book provides the know-how to use Adobe Photoshop and Illustrator as digital fabric design tools. To enter, fill out the form below anytime between now and Tuesday, July 16, 2013. We will announce three winners on the blog next Wednesday, July 17. Good luck! Last week's winner of a Laurel dress pattern and three yards of custom printed fabric is Linda	Armenti! Congrats! 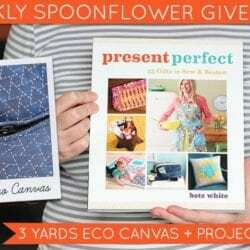 Win a Copy of Present Perfect + 3 Yards Eco Canvas! I am beyond myself with excitement!!! I got my pattern in the mail awhile ago and it took until today to decide on the fabric. I got so befuddled I narrowed it down to about 16 pages of faves and my son helped me make the final decision. It’s going to be Beach Glass made 3 years ago by Chickie. What helped was seeing an actual skirt made of it. The Flickr group is amazing and helps with the perspective on the design. Yeeps! Can’t wait to get it and get my Laurel made! Thank you Spoonflower I’m a fan for life!!! !